A stunning piece, this brilliant design captures the powerful bond between a Money Spouting Pi Yao and the Bagua Horoscope Coin. The Money Spouting Pi Yao will harness prosperity, increase happiness, generate opportunities and usher in money. On the other hand, the Ru Yi under its feet signifies smooth-sailing undertakings with less obstacles. Its pair of incredible wings signify its ability to fly high and reach greater heights/goals. The Bagua Horoscope coin essentially provides powerful protection and safeguard against numerous dangers for all the 12 zodiacs, especially if the year is not a good one. It combines 2 potent symbols of protection: 8 trigrams of the bagua and 12 earthly branches of animal zodiacs. Empowering the amulet is the mantra coin inscribed with sacred mantras of good fortune, immunity against loss and shielding off dark forces. They are the mantras of Avolekitesvara, Yellow Jhambala and Goddess of White Umbrella. These sacred mantras provide a special channel to the cosmic realm to invoke divine help. Inspired by the need to activate its true potential and power, a shy energy infused tag is hidden under an exquisite pendant of the mystic knot. The amulet has the ability to transform negative chi into positive, overcome obstacles, prevent annual dangers caused to zodiacs, subdue bad luck, diminish obstructions, combat bodily harm and terminate stress. The Pi Yao is suitable for stimulating growth in business, securing safety for the family, warding off negativities, inviting fortune/wealth, protecting against intangible afflictions, and appeasing the Tai Sui and Sui Po. In 2017, those who are born under zodiacs ROOSTER, RABBIT, HORSE, RAT, MONKEY and DOG have to carry along this amulet to remove dangers and make the best out of 2017. Featuring "Six Signs of Longevity" and "Nine Health Incantations", this stunningly powerful amulet pulverizes all issues related to health, paving you to a stronger and less sickly year. Having great control over viruses, diseases and illnesses it wields its miraculous power, guard against loss of health and loss of life. Incredibly powerful, it wards off the terrible potential for reversal of health. Those who are vulnerable to monthly ill winds and diseases, for example elderly people or people whose zodiac show signs of health issues in the year will require this protective amulet. Some afflictions, pesky stars and evil spirits tend to bring a host of health problems big and small. This amulet features Zhang Daoling (Patriarch of Taoism) and his most powerful incantation that diminish ghostly attempts and powerfully dissipate any evil energy charging over you. This Taoist saint bestows safety from premature death and offers supreme protection against all forces that threaten your safety. The amulet ensures that you are not caught in the wrong place at the wrong time. This safety amulet provides protection against injuries, bloodsheds, mishaps, dangers and accidents caused by underlying supernatural realms. Auspicious energies will be at work creating an invisible aura of protection. You will be blessed with safe journeys at all times. Also inscribed is the mantra of White Umbrella Goddess. The powerful Buddha of Protection who carries a white umbrella has the power to symbolically dispel any evil intentions of people who may want to hurt you. Be mindful that everyone is vulnerable to jealous intentions of unscrupulous people, enemies or competitors, so it is better safe than to be sorry. This mantra can also ward off black spells casted by the underlying currents of jealousy and making them harmless. It fights against illnesses caused by black magic and mysterious sicknesses due to dirty energy. This amulet if kept in your car can also protect you from bad spirits, burglars and people of bad intention so that one can enjoy safe journeys. Those whose zodiac forecast hinting the looming of negative stars making you vulnerable to danger, bloodshed and injuries in the year will require this amulet for safety. This is the amulet meant for those whose life force and spirit essence are low where elements do not combine well with the elements of the year and need an injection of strong divine remedy. If not remedied, a person with weak life force and spirit essence are more vulnerable to the year's afflictions and to the negative feng shui winds. Remember that obstacles will keep manifesting unless you successfully subdue them by increasing your aura power. When your aura is strong, it will give you great substance to your inner and outer strength. The amulet will ensure that you do not overtax your own energy levels. It not only strengthens your outer persona, it increases your inner life fortune and inner power radiating out, giving you the strength needed to control difficult situations and rise victorious. The Universal Tortoise with protection wheel of elemental astrology was devised by an early Nyingma scholar named Khyung Nag Shakdar. The outer circle is incribed with fifty sanskrit vowels and consonants witten in Tibetan script. There then follows a long prayer that makes offerings and seeks protection from goddess Kali and the Tathagata (Sakyamuni Buddha). This protects you from the hostility of the planets, stars, earth spirits, nagas etc. Besides, the tortoise also contains the eight trigrams in King Wen's sequence with seed syllables, which protect against the malevolent influences of the nine mewas. In short, this allows the protection from evil. This wishfulfilling amulet promises you a quantum change in making your impossible desires possible. You will be effortlessly reaping rewards. Boundless opportunities will present. The universe is fundamentally giving and will cheerfully provide opportunities and blessings for individuals who embrace a positive attitude in your wishes. It opens up endless possibilities, superlative success, overflowing possibilities and materializes your dreams. You will experience a life uninterrupted by obstacles setbacks and sufferings. The main purpose of this amulet is to make all your wishes come true, transform bad luck into good luck, especially great for years when one's zodiac has bad luck. It has esoteric protection against negative energies, hostility, bad intentions and obstacles. Inscribed is a powerful taoist incantation that can ward off all forms of obstacles that block your wishes. It will materialize all wishes as long as you desire, answer to all requests, provide protection and belssings, avoid disasters and bring everything good to you.The magic created will move events, people and circumstances to fulfill all your dreams. You will be unrestrained and seeing enormous changes that leads to boundless returns. You will also experience a positive "cheerleading internal voice" that encourages you, protects you and keep you out of trouble. Also insribed is the powerful Wishfulfilling Multiplying Mantra that will actualize your wishes by 100,000 times more. This amulet can be carried along by those who are in the crossroad of relationship, career, education, business, health and other problems. 1. 8 Petals Lotus - is essentially used to signify joy, peace, purity and sincerity. 2. Triple Union of victory against disharmony; namely the Eight-limbed Lion, Fish with Hair and Makara Snail.They are the pairing of six mythological enemies: otter and fish, seamonster and seasnail, garuda and snowlion. These ancient practice of uniting the rival pairs are for reconciliation of disharmony and disputes. 3. "Li Hexagram" and 8 Fire Balls - represents the BIGGEST FIRE element for remedying quarrelsome energy that belongs to wood element. 4. Mantra of Manjusri - this is the mantra of wisdom "Om A Ra Pa Ca Na Dhih" representing the attainment of ultimate realization from the blossoming of wisdom. 5. Mantra of "Exalted One Extremely Pacifying All Hatred" - If you request the Exalted Soft Glorified One (Manjushri), then everyone will become loving to you. 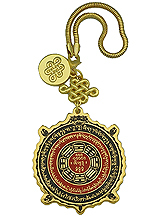 The mantra is inscribed in English on the amulet so that you can recite it at your convenience by looking at the amulet, "TADYATHA DIRI TISHTA TASKARA BADUSI MACHALA MACHALA SVAHA (7x)". 6. Nine Birds (including a Phoenix) - an ultimate symbol of joy and happiness that brings about a life free of hostility and quarrels. It helps to take away your problems, worries, stress, anger, pressure and sadness. Particularly excellent for those working in stressful careers. This safety amulet provides protection against injuries, bloodsheds, mishaps, dangers and accidents. Auspicious energies will be at work creating an invisible aura of protection without you realizing it. 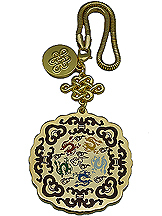 The "yang" side of the amulet has the image of "Chung Kwei" and two "Crossed-Vajras" that diminish ghostly attempts and powerfully dissipate any evil energy charging over you. On the "yin" side of the amulet is inscribed with two magical taoist incantations that seeks help from the heaven to bless one with safe journeys at all times and to remove mishaps, accidents, injuries and negativities caused by underlying supernatural realms. Also inscribed is the mantra of White Umbrella Goddess. The powerful Buddha of Protection who carries a white umbrella has the power to symbolically dispel any evil intentions of people who may want to hurt you. Be mindful that everyone is vulnerable to jealous intentions of unscrupulous people, enemies or competitors, so it is better safe than to be sorry. This mantra can also ward off black spells casted by the underlying currents of jealousy and making them harmless. It fights against illnesses caused by black magic and mysterious sicknesses due to dirty energy. This amulet if kept in your car can also protect you from bad spirits, burglars and people of bad intention so that one can enjoy safe journeys. Those whose zodiac forecast or personal 8 Characters chart hinting the looming of negative stars that indicate danger and injuries in the upcoming year will require this amulet for safety. Splendid and astonishing, this amulet features Garuda and consecrated with the "Exalted Mantra King of Great Breath". Known as the mythical lord of the birds. the great powered Garuda defeat demon spirits that bring illness, setbacks and obstacles to success. Therefore, Garuda is an esteemed destroyer of 5-Yellow (a demon). Feeding on powerful serpents and nagas, no naga is able to survive Garuda's grip or bite. Garuda's triple sadhana (practice of three deities) is highly effective for removing obstacles or illnesses, especially naga-related afflictions such as kidney failure, plague and cancer. Therefore, Garuda is a revered cure for contagious diseases and deadly illnesses. Next, the long mantra called the "Exalted Mantra King of Great Breath" is the anecdote to diseases sent out by the breath of the great lord of all the spirits of all 3 continents called Grinning Teeth (sekpa). All humans and spirits living in the world may contract various sicknesses and having their lives taken away once the destructive breath fills up the whole world and touches sentient beings. Whenever the mantra is worn, touched or kept, sentiant beings will not be harmed by the breath, protecting you against contagious diseases (including the infamous Ebola), receiving no harm or sicknesses (tongney) from wind, bile, phlegm etc. This is a must have if you are getting on board a flight or travelling to contagious countries. 1. The Five Gods of Wealth are categorized as the Military, Abundance, Civil, Righteous and Windfall deities of the five directions. The five directions are north, south, east, west and center. Each of them play different roles in handling financial matters and bless people in different manners to accomplish riches in different aspects. 2. Millionaire Lock Coins with the lock shape denoting the locking up of money that has been made as savings. A popular phrase on the coin "wong karm man liong" expresses the sentiment "ten thousand tahil of pure gold". In ancient times, only the royal families, officials and tycoons were able to possess this much of gold! Today, this is equivalent to millions or even billions. 3. Taoist Incantation of the Five Gods of Wealth is the key in empowering this amulet by providing a special channel to the cosmic realm to invoke their divine help. 4. Mystic Knot - the infinite patterns of this symbol will have the influence of this lucky symbol multiplied infinitely, thus enjoy extra good fortune. It will also multiply your health luck, wealth luck, relationship luck and fortune in all areas of your life throughout the Period 8. 5. Treasure Wealth Vase - the treasure vase is a vase of inexhaustible treasures regularly employed for increasing wealth and spreading abundance. 6. Pineapple, tangerine, carp and gold ingots are all symbols of great abundance and flourishing wealth. This amulet promises you the millionaire temptation, generates financial success, enables you to earn higher incomes and builds greater fortunes. The type of wealth invited refers to both mainstream income (your business/career) and irregular income (investments/real estate/side income). It also magnifies speculative affairs such as lotteries, 4-digits, football bets, horse racing and the stock market. Place this amulet together with your investment folder, share certificates or gambling tickets to bring maximum opportunities of winning or striking large gains. It is recommended to be displayed at the southeast corner, your personal sheng chi direction, wealth corners and at your home's main or bedroom doorknobs.